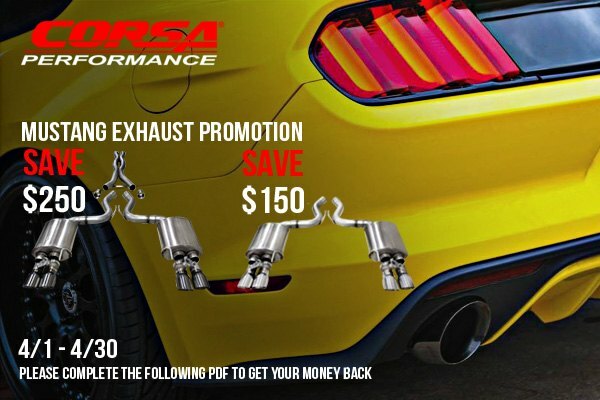 Corsa Mustang Exhaust Promotion at CARiD - 1 month only! If you want your Ford Mustang to perform to its best, the first upgrade to consider is an aftermarket exhaust system and Corsa is one of the best options to go with. Having your pony equipped with a Corsa exhaust system gives you a lot of benefits such as the improvement in horsepower and torque, and beautiful deep exhaust tone. Built from 3" diameter 304 stainless steel tubing their exhaust systems are among the best-sounding options on the market. For 1 month only Corsa offers a wonderful deal - receive up to $250 mail-in rebate on qualifying CORSA Performance GT Exhaust. The offer is valid until April 30, 2019. Please fill in the following PDF form to get your rebate. Hurry up and take part in Corsa Sale at CARiD! Hot Exteme Dimensions Promotion at CARiD! Don't miss Stainless Power Promotion at CARiD! Quick Reply: Corsa Mustang Exhaust Promotion at CARiD - 1 month only!